The first phase of Medipedia crowdsale is all set to begin from 8 October 2018. 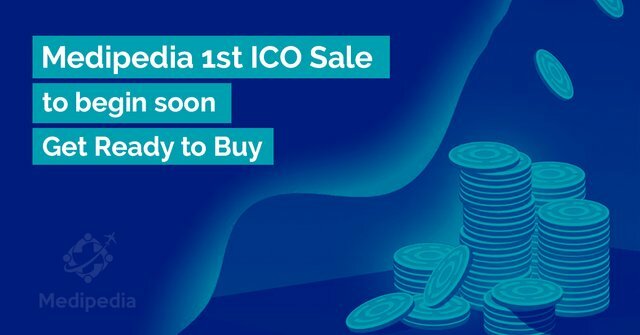 Medipedia is offering 10% 1st ICO sale bonus. The pre-sale has already successfully ended with the hard cap target. Now, the company as well as its investors are all ready for the upcoming crowdsale. Those, who are planning to invest at this stage, would be required to sign up on the Medipedia website and verify their KYC to be eligible for ICO participation. You can find more details here. The Medipedia project was founded on the concept of a decentralized healthcare information platform where foreign medical consumers could find reliable information about medical institutions and service providers to be able to make the right selection. The project officially started with the first version of the Medipedia whitepaper released in June 2018, which received a huge response from the audience. The Medipedia PoC (Proof of concept) was released in July 2018 with a platform where medical consumers can connect with doctors and medical institutions to find, compare, and get the best health consultation for any medical condition. Besides that, the platform also allows users to make a medical appointment online and make payment using the MEP tokens of the system. The pre-sale of the Medipedia (MEP) tokens was held in August/September 2018. The token price for the pre-sale is $0.01 and a special bonus of 20% was offered on all the token purchases made during the event. Medipedia registered a huge success in the pre-sale event and reached the hard cap target of $2 million with time remaining. The first public crowdsale of Medipedia will be held from 8 October to November 2018. The process to buy in the ICO has been explained below. The MEP tokens will be sold at the same price of USD $0.01 during the ICO event, however, the bonus has been reduced to 10%. The hard cap target for the ICO (phase 1 and 2) is $10 million and the soft cap is USD $1 million. Anyone can purchase the tokens during the sale in exchange for Bitcoin (BTC), Ether (ETH), Litecoin (LTC), EOS and ATBcoin. The tokens purchased during the pre-ICO and ICO of Medipedia will be delivered to the respective wallets of the buyers soon after the sale ends. The KYC (Know Your Customer) is mandatory for all participants of the Medipedia ICO. The purchase to buy MEP tokens in the ICO is very simple. You just have to create an account on the Medipedia website https://medipedia.io/ and then show your interest to buy the tokens. Following that, you will be asked to verify your KYC, post which you can go on to participate in the token sale. In order to purchase MEP tokens, you must have sufficient BTC/ETH/LTC/EOS/ATBcoins in your digital wallet. If not, you can add them prior to your purchase. After that, you can select the number of MEP tokens you wish to purchase and then send the price amount to the Medipedia’s smart contract wallet. Once the payment is verified by the team, you will get a confirmation of a successful purchase.